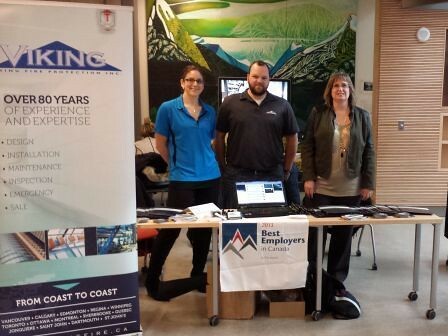 For a 4th year in a row, Viking attended Seneca College Job Fair on February 6, 2014. This event was an excellent opportunity for us to meet students eager to start their career at Viking. Everyone was very welcoming and we enjoyed the kindness and interest of all students. In the picture, from left to right, Katherine Tipping (Toronto Inspections Coordinator) Adam Blunt (Toronto Design Coordinator) and Caroline Gobeil (Human Resources Advisor).